One thing that I love about being a blogger is that I get to constantly go out and try new things here in Hawaii. But today, I’m going to tell you about one of my old favorites, a place I have been going back to over and over again for years. 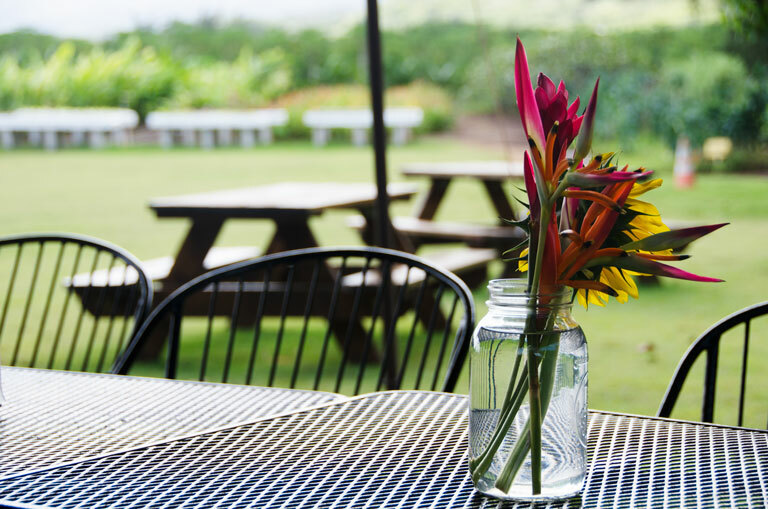 Kahuku Farms is a farm-to-table restaurant run by two families with deep roots in Hawaii. It’s one of those hidden gems that I get so excited to share with people. The Matsuda and Fukuyama families migrated to Hawaii from Japan in the 1900s to work on sugar plantations. Shinichi and Torie Matsuda farmed bell peppers, papayas, watermelon and bananas in Kahuku in the 1940’s. Later, their son started to farm as well. During the same time, Masatsugu and Nora Fukuyama also lived in Kahuku. They farmed watermelon, eggplant, papaya, and cucumbers. They too were later joined by their son, Clyde. Clyde and Melvin became friends and discovered that they had similar goals and ways of doing things. With a handshake agreement, they decided to create their own company that sold fruit and vegetables wholesale. They later decided to create Kahuku Farms to share the wonders and bounty of farming with friends and family, to educate, share and offer hands-on experiences that would enhance the quality of life and result in a deeper appreciation of agriculture as their purpose. Today, the farm is still owned and operated by the families. They hope to expand to agri-tourism next. I go to Kahuku Farms at least once per month. It’s my favorite place to get lunch in Hawaii. Not only is the food incredible, but you are also supporting local families and eating the freshest food around. Plus, as you eat your lunch, you can see the farm where your food was grown. It doesn’t get more local than that. As you eat your lunch, you will get incredible views of the farm. Vegetarians rejoice! There are no dishes with meat. But if you are a meat lover, trust me, you won’t be missing it. Among their famous dishes is a grilled veggie panini on focaccia bread with grilled eggplant, bell pepper and zucchini, tomato, hydroponic lettuce, fresh mozzarella, basil, and balsamic herb mayo. Another favorite is a grilled veggie salad with hydroponic lettuce, grilled eggplant, bell pepper and zucchini, tomato, cucumber, mozzarella, and lilikoi balsamic dressing. They also serve some different juices, smoothies, and soup. I always want it all! But, every time I go to Kahuku Farms, I get the same thing: a farm pizza and side salad. Their farm pizza is a tomato-eggplant bruschetta topped with mozzarella and basil-macadamia nut pesto. If I’m extra hungry, I also get a Tropi-Kale Smoothie. That right there is pure heaven. One new addition to their menu is an acai bowl, made with their own Hawaiian acai, the first locally grown acai in the area. And don’t forget to get dessert. I always have to get dessert at Kahuku Farms. Their ice cream and sorbets use fruit and other ingredients from the farm. My personal favorite is their grilled banana bread topped with vanilla caramel sauce and vanilla haupia (coconut) sauce. Kahuku Farms offers two different tours of the farm, where you will enjoy a tractor-pulled wagon ride. During the Grand Tour, you can learn about the history of the farm. You will ride through the farm and learn about the farming process and the foods that the farm grows. Tours are offered Friday at 2:00 p.m. and typically lasts about 1 hour. You will get to sample farm fruits right off the trees! The Grand Tour costs $32.00 for adults and $22.00 for children ages 5-12. Ages 4 and under are free, but this does not include a fruit sampling. Fruit sampling for children 4 and under can be added to your tour package for $4.00. If you want a shorter tour, you might want to opt for the Smoothie Tour. This tour takes you to see where the papaya and apple bananas for the smoothies are harvested. Included in the price is a yummy fresh fruit smoothie. The smoothie tours are offered Monday and Wednesday at 1:00 p.m. The cost is $16.00 for adults and $14 for children ages 5-12. Ages 4 and under are free, but that does not include a smoothie. You can add a smoothie for children under 4 for $4.00. Kahuku Farms has changed a bit since I first started going. One of my favorite additions has been an expansion of their gift shop. They have also started offering more items for sale in the past few years. The shop sells both bath and body items as well as culinary gifts. These items are made with some ingredients grown right on the farm. I love to give these to people as gifts, and they make great souvenirs that are easy to take home. Bath and body items available for include body butter cream, body wash, and hand soap. Culinary items are packaged to fit in your suitcase and survive a trip on an airplane. They include many of the items that they serve in their cafe. You can purchase vanilla caramel sauce, lilikoi butter, lilikoi jelly, pineapple papaya spread, and lilikoi balsamic dressing, among other items. In addition, their Kahuku honey is made with the honey from the farm’s bees. Depending on what’s available, the farm also sells fruits and vegetables. Grab some apple bananas and eat them for breakfast in your hotel room! T-shirts and reusable bags are also for sale. Kahuku Farms is one of those places that you might pass by if you’re not looking for it. A local favorite, it is located on the north shore, minutes away from Turtle Bay Resort. Make a day out of it, and explore the hidden gems on Oahu’s north shore while you’re up there. And enjoy the delicious food!